Mathematics for the Liberal Arts provides a comprehensible and precise introduction to modern mathematics intertwined with the history of mathematical discoveries. The book discusses mathematical ideas in the context of the unfolding story of human thought and highlights the application of mathematics in everyday life. 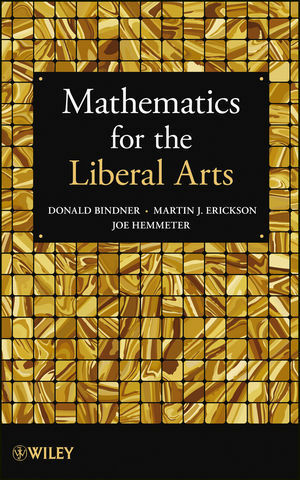 Mathematics for the Liberal Arts is an excellent introduction to the history and concepts of mathematics for undergraduate liberal arts students and readers in non-scientific fields wishing to gain a better understanding of mathematics and mathematical problem-solving skills. DONALD BINDNER, PhD, is Assistant Professor in the Department of Mathematics and Computer Science at Truman State University. MARTIN J. ERICKSON, PhD, is Professor of Mathematics in the Department of Computer Science at Truman State University and the author or coauthor of numerous books on mathematical topics. JOE HEMMETER, PhD, is a freelance software developer and a past professor of mathematics at both the University of Delaware and Truman State University.